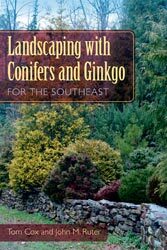 Great Lakes area gardeners might glance past this book due to the southern reference in the title (Landscaping with Conifers and Ginkgo for the Southeast). However, many of the plants described in it are applicable to the north as well. Consider this guide if you are interested in conifers, which are among the most beautiful and versatile of all landscape plants. They are low-maintenance and offer a variety of color, form, and texture year-round. The authors have an authoritative command of their topic. Tom Cox, past president of the American Conifer Society, is the founder and owner of Cox Arboretum and Gardens in Georgia. John Ruter, Allan M. Armitage Endowed Professor of Horticulture at The University of Georgia, is a teacher, ornamental plant breeder, and author. The result of years of research and horticulture experience, this compilation will help both novices and professionals build their conifer knowledge. Cox and Ruter present a wide variety of conifers and tips on growing, pruning, and preventing disease and pest problems. The Great Lakes reader can skim over specific southern growing advice. There is plenty else here to learn: the authors will teach you about conifers, no matter where you call home.